Today’s guest, Rosemarie Rossetti, is an international speaker, consultant, writer, and publisher who walks her talk. She’s also the most adaptable person I have ever met. We have an inspiring conversation about overcoming adversity and living with conviction, and why she built the Universal Design Living Laboratory. Rosemarie’s life was transformed on June 13, 1998. There was no wind, no rain, no clouds. It was a beautiful Saturday, and she was celebrating her third wedding anniversary with a couple’s bike ride. Then, suddenly, there was a loud noise and she was engulfed by a three-and-a-half ton tree. She was paralyzed from the waist down with a spinal cord injury, but Rosemarie looked deep into herself and found new strength and resolve. She had invested too much into her life to give up. 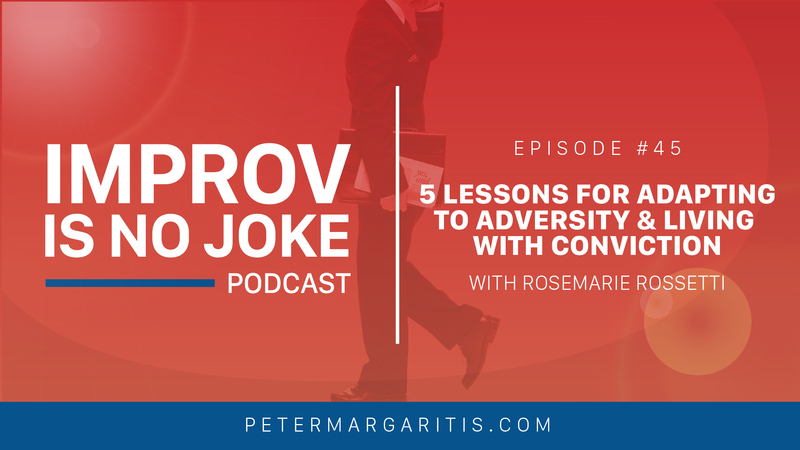 In her keynote speeches, Rosemarie shares the lessons she has learned since that fateful day, and demonstrates how to rise above adversity and live life with conviction. Do something new every day. Focus on a hopeful future instead of your self-pity. Believe the impossible just might be possible. Allow more time to get things done, and be patient with yourself. To lower your stress, lower your expectations of other people. This moment also changed her career path. In addition to motivational speaking, Rosemarie speaks and consults with a focus on universal design housing, or making homes that are both livable for a lifetime and sustainable. Rosemarie and her husband want to start a discussion about the home of the future, which will marry universal design, green building, a healthy home, and technology. They built a national demonstration home and garden in Columbus, Ohio: the Universal Design Living Laboratory. It is the highest-rated universal design home in North America, earning three national certifications. They have 217 sponsors that contribute products and services necessary to build the home, either at no cost or reduced cost. You can take a virtual tour of their house on UDLL.com (bonus points if you can spot their cat). You can also pick up the first chapter of Rosemarie’s upcoming book, The Universal Design Toolkit, for free. It’s a listing of the universal design features, room by room, in the house. Disability insurance saved Rosemarie’s life. She recommends everyone in the audience purchase their own policy. If you are employed by another company, you need to talk with your HR people and learn if disability insurance is part of your current benefits, and what it covers. If you are self-employed, start contacting your financial planners and financial representatives that sell disability insurance, and get an individual policy. LifeHappens.org has a disability insurance calculator that will help you estimate the income you need to maintain to your current standard of living, which will help you in purchasing a policy. Click to download the full Transcript PDF. 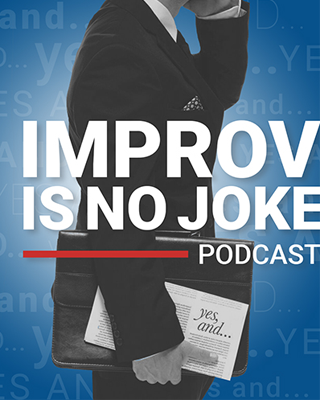 Peter Margaritis: Welcome to Improv is no Joke podcast, where it’s all about becoming a more effective communicator by embracing the principles of improvisation. I’m your host Peter Margaritis, the self-proclaimed chief edutainment officer of my business, The Accidental Accountant. My goal is to provide you with thought-provoking interviews with business leaders so you can become an effective improviser, which will lead to building stronger relationships with clients, customers, colleagues and even your family, so let’s start the show. Peter: Let me start off by saying welcome, Rosemarie, and thank you for being a guest on my podcast. Rosemarie Rossetti: Well thank you for inviting me Peter. It’s my honor. Peter: I’m looking forward to our conversation. I know, and I may have said this in the intro, I know Rosemarie from the National Speakers Association, the Ohio Chapter, and she has just been an absolute delight to get to know. I know you guys who listen to this are going to walk away in awe – trust me on this. Rosemarie, can you tell the audience about who you are and what has transpired in your career? Rosemarie: Well, I’m a speaker, I’m a writer and author, a consultant, last component of my career, and my current focus is on accessible housing, universal design housing, or making homes livable for a lifetime, and that is a result of an accident that I had in 1998. So, before that, I had been on the faculty at Ohio State University teaching courses in public speaking and teaching methodology. I also had a very long career as a horticulturist, both as a teacher of horticulture and working as an interior horticulturist. I also wrote a book about keeping plants healthy indoors. So I have a diverse background, and my educational training is in education, specifically in agriculture. I had a dual major, as an undergraduate, in horticulture with agriculture education. I started a career asked to teach at the high school vocational level, and then teaching at the university level, and then working as an interior horticulturist for a while. Then I started my speaking business, full time, after leaving the University after an 11-year stint on their faculty… and that’s about the time when life changed in an instant, Peter. And you have seen me and and know a little bit about me. There was a life before June 13, 1998, which was a very academic life and following a career to be a speaker and a trainer for public speaking, and then suddenly on June 13, 1998, while riding my bicycle, suddenly a 7,000-pound tree fell on top of me and instantly left me paralyzed from the waist down. Peter: Oh my god I didn’t realize you were on a bicycle at the time. Rosemarie: Yes. No wind, no rain, no clouds. Just a beautiful Saturday on a beautiful rails-to-trails bicycle route, in Granville, Ohio. My husband and I were celebrating our third wedding anniversary, having a wonderful day, when all of a sudden Mark heard what he thought was a gunshot and he slowed down and started looking, and that’s when he saw the tree halfway down. He tried to stop me, tried to warn me. He was screaming at me, but there was nothing I could do. I was totally engulfed by this 80-foot tall tree, and the live power lines that fell on top of it. Peter: Oh my… rarely do I get speechless, but I believe I am experiencing one. I’m so very sorry. I knew there was an accident and a tree, but I didn’t realize you were out on your third anniversary and riding rails to trails. Wow. That was a very big day, and from that day, as you said, that was a life-changing moment. The rehab that you had to have gone through, how long was that? Rosemarie: It was two years, three days a week. It was like a part-time job. That’s what I did three days a week: I went into physical therapy and occupational therapy all day. My initial surgery was excruciatingly long, where they had to do a spinal fusion. I had a broken neck and a broken back, a spinal cord injury, broken ribs, broken sternum. So after the surgery, intensive care for five days and then transported from downtown Columbus, from the grant Medical Center where the surgery was performed (thankfully, the helicopter flew me in very quickly from the bike trail and they did everything they could to restore function). Then, after the intensive care, it was a very slow ambulance ride to the Ohio State University, to the medical center, where they put me on on a bed… and there I was in Dodd Hall, at the rehabilitation center, an inpatient. I spent, basically, the summer of 1998, five weeks, there, trying to figure out now what? How much function would I get? At that time I couldn’t even hold a pen, I couldn’t feed myself, I couldn’t comb my hair, I couldn’t brush my teeth. I couldn’t move in bed. I was in a neck brace and a body brace, just laying there, wondering now what? It was just a total shock to say I am totally paralyzed at this point, but fortunately, over time, I was able to hold a pen and hold a fork and hold a hairdryer and hold a toothbrush. Things got better, over time. I was discharged in July from the rehabilitation component, as an inpatient, and then went home, where then three days a week I had to be transported back to Ohio State University, for the two-year period. Peter: Wow. I know you have a program speaking on coping with change and dealing with adversity, but I just now realized… the title of the program is “Just Like Riding a Bike.” You went through more change in more adversity than one person should have to deal with. So many people would just give up, or maybe turn to self-pity, or why me. What what was it that kept pushing you forward? What was it that said I’m gonna comb my hair, I’m gonna figure this out, I’m going to do something? Rosemarie: I realized I had a lot invested in my life, Peter. At the time, I had a PhD. I had my own speaking business. I also had a publishing company. I had released the book The Healthy Indoor Plant. I had a wonderful husband, and that’s the biggest key, in that I had a loving relationship with a wonderful man, Mark. Being married to him, at that point, for three years… I just knew I had to move on. And when you think about the catalyst for motivating you, you think about love and you think about what other people go through and you think about all those people who do love you, and they are depending on you. My mother was still alive at the time, in her 80s. She depended on me to be her caregiver in her elderly stage of life. I had a brother with a developmental disability. He needed my assistance and caregiving, as he aging with this disability. I had another brother that was six years older. He depended on me too. So I had lots of people who loved me, supported me, and very much I wanted me to get going with life, and pick things up, and when I looked back at the investment that I already had put into my life, in education and training and building businesses, I said to myself “There’s just so much here. I’ve got to figure out, now, what can I do with what I have?” And the book Man’s Search for Meaning made a huge difference. It was a real turning point, reading Viktor Frankl’s book. I read it very early on after coming home from the hospital, and I remember, with a box of Kleenex at my side, reading that book. He was a survivor in the German concentration camp, and that message of love came through with his book. That was what got him through, to know that there’s hope on the other end, and that the meaning for life is love. Peter: What a very strong and powerful message in dealing with adversity. You have a wonderful team that is around you that supported you; that helped you get through this personal crisis that you are having. They kept you see an end game her, and not giving up, and that in itself… a lot of people can’t achieve in a lifetime, but you achieved it in a very short period of time. You’ve written number of books, a publishing company, professor at The Ohio State University… but then everything changed. How did your speaking business change at this point? Because it took a different focus. Rosemarie: Well, at that point, I couldn’t even get out of the house, so there was a very little speaking. Interestingly enough, one of our fellow National Speakers Association members in the Ohio Chapter, his name is Randall Reader. Rosemarie: He was also a faculty member when I was on the faculty, in the College of Agriculture. He’s an agriculture engineer. So we knew each other as faculty members, and since I was at the Ohio State University for my rehab, of course, he came over to visit me just about every day, and he would do a report and send emails to all the other National Speakers Association members in Ohio to give an update on my status as I was at the rehabilitation center. In one of those visits he said to me, Rosemarie, I have a speech in September. Now this was in June when I got injured… he already has planned for me my first speech, in September. It was in Columbus, and he had the audience and he had the topic. It was going to be getting over your fear of public speaking. That was the topic. Rosemarie: So he said “you’re gonna do this program with me. You’re going to come in your wheelchair and you’re gonna deliver the program just like you would have before your injury,” and he just continued to try and plan this program with me, in my hospital bed. Peter: [laughs] That’s wonderful. So were you able to? Rosemarie: I was. I was able to. I had a personal care attendant, at that time. She worked for me during the week. So she came to my home every day, and that continued from the time I got home in July until May the next year. That’s how long I needed a personal care attendant. Rosemarie: To get me out of bed, to get me dressed, to get me showered, to get me out of the house, to put me in her car to take me anywhere. So, at that time in September, my personal care attendant Yolanda took me to the speaking engagement, and I had an audience and, for the first time, I delivered a presentation in a seated position. It was just pretty different to not be standing and delivering, but to be sitting and rolling around with this audience, and explaining to them that this was the first time for me to be out speaking again. And the irony was the location for this speech: the location was the Berwick Party House here in Columbus. This was a well-known place for people to come and celebrate major holidays and wedding receptions, and I had been at the there many times. In fact, the last time I had been there was that previous New Year’s Eve, where my husband and I went with a lot of family to a New Year’s Eve party and dinner at the berwick party house. Now that was in January. Of course, January 1. Here I am, in September, back in that party house in a wheelchair. They had me speaking off of the dance floor – that’s where they had this program. So here I was, back on the dance floor, doing a presentation in my wheelchair, and I started crying. I started to remember how fun it was to dance, how fun that night was, how I never would have imagined on New Year’s Eve that I would be paralyzed from the waist down. And so I shared that thought with the audience, to let them know how moved I was by being there with them on this experience. Peter: There couldn’t have been a dry eye in that audience after that. Rosemarie: Yeah. It was an emotional time for everyone. I mean, I’m holding them back right now, quite honestly. Wow. That’s wonderful, and it’s a surreal type of story. I can’t even for myself and even fathom the strength that you have to, one, get back up and do a presentation months after an injury like that and, two, go back into a place that you have very fond memories of from few months earlier, and have those memories come back and maintain composure, and and see it to the end. But I can just imagine that, when you finish it, that had to have been so gratifying. That you got back up and you did it. Peter: And it is. Wow. Peter: Wow. So, now you’re back up, you’ve gotten past that hurdle, but today, in your speaking business, are you still training about how to become a better presenter, better public speaker, or has it moved into a whole different direction? Rosemarie: Then the next time, let’s see if you can do a couple of steps, let’s see if you can do five of them this time, and then go sit down. And then each time I would go I’d say well I want to go farther, I want to go farther; let’s see how far I can walk. Pretty soon, I’m walking the length of a football field, only a few weeks later. So that was number one: do something new every day. Number two is focus on a hopeful future not on your self-pity. Now I learned this lesson a year before my injury. It was June of 1997, when Christopher Reeve was in Columbus, on the main stage, at the state fairgrounds doing a presentation. I was in the audience. I was not injured at that time, I was a sitting in the chair listening to him, and that was his message: to focus on a hopeful future and not on self-pity. So I took that lesson from him, a year later, and put his picture by my bedside, when I was in the hospital, to remind me: when my thoughts went to negative thoughts and oh poor me and why did this happen to me and I’ll never be able to amount to anything and my life is wracked so why even live, I had to change my thoughts just like changing a station on a radio, and just stop thinking that way, and let’s turn my thoughts into hope and not self-pity. That was number two. Number three: believe that the impossible just might be possible. I learned that through the many years of physical and occupational therapy, as I was starting to see things that I thought I could never do – never ever imagined that I could do. So when the therapist would ask me “what kind of sports did you used to do?” And I said well I was an avid bicyclist, I love to snow ski, and she was telling me, well, there’s adaptive sports. You could bike again, and you could snow ski again, and you could play golf. And so, when I started realizing the world of adaptive sports, I was just amazed at the equipment that’s out there. So they brought a bicycle call over to me, a three-wheeled recumbent bike, and they put me in and said go ride. And there I was, riding a bike again. Rosemarie: And then then I went to a ski resort here in Ohio with the adaptive sport coalition here, and they put me in a mono ski and said now go ski, and there I was skiing again, from a seated position. So I learned that the impossible just might be possible with recovery and adaptive equipment. Number four, I learned that one by being home and being very impatient. The number four rule is to allow more time to get things done and be patient with yourself. I was just so frustrated by not being able to reach things in my home, not being able to roll on the carpet, not being able to access the laundry facility, not being able to dress myself, or to take my own shower. So I had to realize that I was being impatient, and that slowly I would learn how to do things differently, and that this is how it is for now but things would change and I would get better. So allowing more time to get things done and be patient with yourself is number four. And my final one: to lower your stress, lower your expectations of other people. I learned that by working with my husband Mark: to realize I could not ask him to do everything. Because of all the things I normally did, I was putting that responsibility on him and that wasn’t fair. If you’ve ever had a to-do list from your spouse or partner, you’ll all understand. Rosemarie: Imagine, if your spouse or partner had all day to write a to-do list, what that would look like when you came home. Peter: [laughs] oh my gosh. Rosemarie: funny thing: he told me about that. I’d have these lists and explain I want you to take the chicken out of the oven that Yolanda put in, I want you to take the clothes out of the washer and put them in the dryer, you need to go the drug store before they close at 7 (I have a new prescription to pick up), the dishwasher seems to be unloaded, and you might want to mow the grass. It’s like all these things for one night. So he knew he couldn’t get that done and he was stressing out, and so he would take that list and he would go upstairs to his office and he would he would cut that list in two pieces: a small top piece, and then a large big piece. And then he would take that large big piece and he’d put it in the shredder of his office, never to be seen again. Peter: [laughs] oh that’s funny. But he did come home every night? Rosemarie: He did come home every night. We stayed married. We did have counseling, however. There was so much grief, on his part and mine. It was so much depression. For a full year we had counseling. Don’t think it was easy – there was just too much to lose, with our relationship and the my physical loss and his sense of “oh my gosh I’m overwhelmed,” with all the financial responsibility, the businesses that I was running at the time, and his world of being in sales, working as an outside salesperson, and his income falling. Fortunately, I had disability income insurance, which I hope all your listeners have. It’s an income replacement insurance, and mine kicked in immediately. So I started receiving monthly income from my disability insurance policy. Peter: Well, that’s very, very good advice, for everybody, and especially those who are entrepreneurs and self-employed, and the business kind of lays on their shoulders to keep it going. So I want to go back to your five things here, and number four is standing out to me. Allow more time to get things done, and be patient. Is that what, also, took your business in a different direction, as it comes to designing of your house and a lot of things that you’re speaking on today? Rosemarie: Yes, that was the frustration I was totally frustrated not being able to get into my house independently, not being able to roll on the carpetm not being able to reach anything beyond two feet high. So that created huge frustration for me. We tried to make some modifications, we moved furniture around, we took doors off. We tried what we could, but there was nothing that was going to be a permanent solution in that house to be wheelchair friendly. Peter: So what did you do? Is this where you built the house out in Gahanna? Rosemarie: Right. The new house is just a mile out of Gahanna, on the northeast part of Columbus in Jefferson township, over on Clark State Road. So, as a result of the house being not wheelchair accessible that we lived in at the time, we decided to embark on a new journey, and that’s to say could we find a house that was already built, or did we have to build something new? And as we started that journey, another turn of events is a group of NSA speakers formed a mastermind group, and when I met with the mastermind group for the first time in Orlando and told them that Mark and I were planning to build a new home, and it would be wheelchair accessible, and that we’d like to share what we’ve learned with others. Because we’re not the only ones needing wheelchair accessible homes. We thought, well, maybe we could share our home with other people to learn, and it was this mastermind group that gave us the idea to build a national demonstration home and to get it sponsored by corporations who wanted their products in the home. They also said make it green, since green was a very important component of housing. So my head was spinning, Peter, when this group of other speakers had this brilliant idea. Mark and I were sitting there listening to them telling us “oh yeah she should build this your home and make it a national model and and have tours available for the public and invite corporations to participate with you and get volunteers to help you and you can do this and you can speak about this and this could be your your new horizon,” and I’m like what are you talking about? Rosemarie: It was just totally bizarre. The the biggest, hairiest idea I could ever imagine, and I left that weekend with Mark with the notes that he had been taking, and I’m like where do we start? They’re serious. They want us to build a new house. Peter: Oh wow! There’s something to be said about the power of a community, and I love this this phrase: “the collective knowledge outside of your office far exceeds the collective knowledge inside of your office,” but I can I can imagine…. So where did you start? Rosemarie: Well, we thought real hard about breaking it down and asked them to continue phone dialogues with us. I said don’t just leave us to go back to Columbus. You guys have to help me, because I don’t know what the steps are. I don’t know what we’re supposed to do to get sponsors. I have no clue. So they said “well, you’re going to have to hire somebody that knows about getting sponsors,” so we called the National Association of Homebuilders. It was one of the first calls that started us down that path to find someone to lead us to figure out how to get sponsors. And fortunately they gave us an answer: they said there’s only one man in this country that we would even consider recommending to you. That’s his specialty, and his name is Robert August. He’s in Denver. Give him a call. And so thankfully he took my call and really got excited about working with us, and he’s been with us ever since helping us, teaching us, coaching us, opening up his network, introducing us to these major corporations in the building industry that wanted to be involved, helped us write letters, helped us with our phone scripts, helped us by being on calls with us, helped us by going through the international builders show the next year and taking us with them to meet some of these potential sponsors. It was a monumental task to get 217 sponsors to be contributing, either at no cost or reduced-cost, the products and services to be able to build our home. Peter: Wow, what? Yeah, that is a big, hairy, audacious goal. Wow. How long did that take? Rosemarie: Well, it took several years and it was before we started the design, as well as during the construction, which was 32 months, and while it was under construction. Then, after we moved in, which was May of 2012, we had to finish the landscape and the basement, so we needed more sponsors for that initiative. So it was a major, major enterprise over several years. Peter: And during this time, you weren’t able to do any additional modifications to your current residence? Rosemarie: No, it would not be anyway approachable, with a two-story home that had no elevator and rooms that were just too small and counters that were too tall. No privacy in the bathrooms. I mean, we looked at that as a possibility and said no, that’s not financially feasible. We can’t make this house work long-term. However, we did live in that house from the time of the accident till the time we moved into a small apartment, during the construction of this house. We were there 15 years, in total, so we had the experience of the frustration. Peter: Well, I got to see your house first hand a couple weeks ago, maybe a month or so ago, and it is a very, very beautiful home. Rosemarie: Thank you, thank you. We invite all of your listeners to take a tour. We have a website with a virtual tour that you can take, thanks to our partner Google. They took over 700 photos of the home and stitched them there together, so you can actually take a virtual tour on our website, which is simple: the initials udll.com. So if any of you are interested in taking the tour of our home, it’s pretty cool. Going into the front door and going through the house, you can actually zoom in and zoom around the ceilings and the walls and the floor. You can read the labels on the Campbell’s soup cans in the pantry. You can go out the back door from the great room into the patio area and see the landscape. You can go downstairs into the lower level, where we have a classroom, another bedroom, a bathroom, an exercise room, and storage area. So it’s a great tour and it’s a neat game to play. I tell people that, if they would like to look very closely while they’re on tour, we have a cat. Her name is Kiko. Now Kiko is a beautiful orange tabby cat that we we got from the rescue shelter, but Kiko is the photo bomber. Rosemarie: They continued to get into the picture when the photographer was here. So I tell people, if they want to play a game, as they’re going through the tour look for Kiko. She is in that tour somewhere. Peter: Oh, that’s great. I also want to take a moment and read something off your website about your home. It says since this home is the highest rated universal design home in North America earning three national certifications. it receive a silver LEED certification from the US Green Building council and a gold rating on the National green building standard program. Okay, that’s real impressive. Your story is to me is just so fascinating! How it has transformed and moved in in different directions, and quite frankly in my world of improvisation and talking about improvisation, you are the most adaptable person that I think I’ve ever met, and you have such a wonderful Yes, And attitude not No, Because or Yes, But to help drive you forward. It’s just amazing, your story, and to go out and get all those sponsors, to basically build your house, and you said that you want you’re not the only person. So how are you, today, trying to make an impact on on the housing industry, with your design and your home? Rosemarie: Well, one is through our website, which is of course global. So it’s been promoted throughout the entire world so that people can go and learn from us and borrow some of the ideas. We also have a free chapter of my new book that is at udll.com, and that’s a great tool. It’s a listing of the universal design features, room by room, in the house. So that’s a great checklist to look at why you’re going on tour. If you’re not familiar with universal design, let me help explain it: as you look at this house, you’re going to recognize that the doorways are wider, you’re going to recognize there’s no steps to get into the home, you’re going to recognize that there are multiple heights of countertops (in the bathroom, as well as the kitchen), you’ll recognize that under the sink and under the cooktop there’s space for someone in a wheelchair for their knees, and these are all universal design features. These are design features that accommodate the majority of the population, without any specialized design. It’s just good design, and so that’s one way that we’re promoting. The catalyst for change is to have this website. We have over a hundred articles, we have the virtual tour, we have video tours, we have webinars, and we have the new book. The new book that I wrote is The Universal Design Toolkit, and it will be sold as an electronic book complete with a Learning Library System. So it’s got a series of webinars and videos that have never been seen on our website before, so it’s a whole package that people can purchase. If they’re really serious as a professional or as a consumer, if that they really have a need to know what they should do to make their home more livable for a lifetime, or to accommodate an aging population or a population that has a disability. So, Peter, that’s one way we’re working: through our website, through the resources there, through the Universal Design Toolkit, and all of the other wonderful pieces that are there. On another front is the personal tours. We do schedule, by appointment, groups to come in. So far we’ve had 2300 people touring our house, and they usually stay about an hour and a half or two hours. We invite consumers, builders, realtors, interior designers, the medical profession, students from elementary school, middle school, high school, and college, physical therapists, occupational therapists. Anyone who can benefit and that would like to see this house in person just needs to call me with a group and we’ll arrange that. I speak for a living, nationally, so I do keynote programs at conferences. I also deliver webinars. Those are more particular for the professional organizations that would like to have me deliver things. And I write lots of articles for professional and consumer-based magazine. So Mark and I are very involved. We work together full-time, as a team, to be the catalyst. Peter: That’s wonderful, and I just took a little tour of the house, because I was on the website. I didn’t see the cat, but I’m gonna go back after this and see if I can find it. I do have to ask this one this question: are you solely speaking on this universal design, or are you also speaking the motivational speaking about your accident and and the five things that you learn from that accident? Rosemarie: I do speak, still, as a motivational speaker, in addition to speaking about the house, but there’s a third element and I kind of hinted at it earlier when I talked about disability insurance. I’m also a national speaker for insurance corporations and organizations. They bring me in to motivate those financial planners and representatives and agents who are selling disability insurance. They don’t usually get to here from a claimant, from someone who’s had an injury to realize how important that disability insurance is to that family. So I reveal my story. I share with them the data, in terms of the cost of having the disability and all the things that had to factor in to make me able to be able to live at home and then to regain the ability to start working again. So I teach them about how to sell it and I teach them about its importance. Peter: Wow. So I have to ask this question: being an entrepreneur, how does one find this type of insurance? Peter: Well, you as a person who’s employed by another company need to talk with your HR people. If you’re working for another corporation, it may be part of your benefit. Now it may be included in your salary, as it was with mine. I had disability income insurance as a faculty member at Ohio State University through the State Teachers Retirement System of Ohio. So that was a benefit that I just took for granted. It was just part of my benefit package. Fortunate for me, when I left the university, that policy followed me for two years so I could start the business and still be covered. I was injured a year and a half after I left the university, so that policy was still in effect. So that’d be my first inquiry, for those of you working for a corporation: find out from your HR department what is the group policy, and is it enough or do you need something as a gap to buy individual insurance? And for those of you who are self-employed, you really need this policy. As you heard my story, life would have been so much different if I had no income. I would have been bankrupt, lost the house, Mark and I would have had major stress and turmoil. Who knew what would happen to our marriage as a result of that fiasco? So please start contacting your financial planners and financial representatives that sell disability insurance, and get an individual policy. That’s great information for my audience because, in all honesty, I don’t think I ever really, when I was working for a company, ever paid that close attention to it. I can’t tell you if I had it when I was at the last three or four employers, and I probably didn’t give it, really, a second thought. But I’m giving about five thoughts right now, because being self-employed… yeah, I think I know what I’m doing when we end this. I’m making a few phone calls. Peter: But I would have never, one, thought about it and, two, I think a lot of people in my audience have probably never thought about it and will be thinking a lot more about it because, yeah, if we didn’t have that, who knows where your journey would have taken you? And it all may have worked out, but then again that’s what they have insurance. Rosemarie: Right, and there’s lots of good resources out there to learn more. There’s also calculators that are available, and so I might recommend something. There’s one website that I often recommend, it’s LifeHappens.org. It has various insurance topics, of which one of them is disability insurance. So just go there and click on the calculators, click on disability insurance, and that might help you as you’re looking at, well, how much do I need? In terms of what percent of my income do I need to protect, and how much can I get? It’s going to be individual for everyone, in terms of their ability, even, to qualify for a disability insurance policy based on their health. Someone who is in really bad health is going to, possibly, have to have a rider or a wait time to wait and see how they’re going to recover from something like a cancer diagnosis. Peter: Okay, that’s good information. And just so my audience knows, if you want to read Rosemarie’s bio on her website: RosemarieSpeaks.com. Her bio, and she’s she’s really laid out most of it through the story, but as I’ve read through it there was a few things that jumped out at me, and one: she holds the title of Miss Wheelchair Ohio 2004? Rosemarie: [laughs] Yes, it is true. I bet most of your listeners have no idea what that is. Peter: I sure didn’t, and the other one that I was really cool. In 2002, she carried the Olympic torch in Columbus, Ohio, on its way to the winter olympics. Rosemarie: Yes, that was one cold January night, but what a proud moment to have that flaming torch in my arm as I wheel down High Street, down near the campus here at Ohio State University, surrounded by my friends, family, and community. They were all there cheering me on. Peter: Well you are a very special lady who just has an incredible amount of will, drive… I’m so in awe of this conversation, and it’s been a pleasure getting to know you a lot better than I have through our conversations at the Ohio Chapter of NSA meetings, and that time we were at your house for that seminar. I can’t begin to thank you for taking time. You have such a powerful, wonderful story that… I don’t care who you are in my audience, this applies to all of us, and I hope you take it to heart. I’ll put her website and all the the references that she made in this podcast in the show notes for you to download, and everybody go look into your disability insurance. Rosemarie, thank you so very much. Rosemarie: Oh you’re very welcome. Thank you Peter. It was a pleasure. Peter: I would like to thank Rosemarie again for taking time out of your schedule to give us her thoughts on dealing with adversity, the home of the future, and disability insurance. You can learn more about Rosemarie on her website www.RosemarieSpeaks.com and book her to come out to speak to your organization. Also remember to go to www.udll.com and take a tour of her home. In episode 46, this is part two of my conversation with Greg Conderacci, who is the author of the book Getting Up! : Supercharging Your Energy, along with being a marketing and energy consultant, speaker, facilitator, trainer, and teacher. In episode 35, Greg and I discussed physical and intellectual energy. In episode 46 we finish our discussion on intellectual energy and then discuss emotional energy. You don’t want to miss this episode. Remember, you can subscribe to my podcast on itunes, stitcher, and google play. 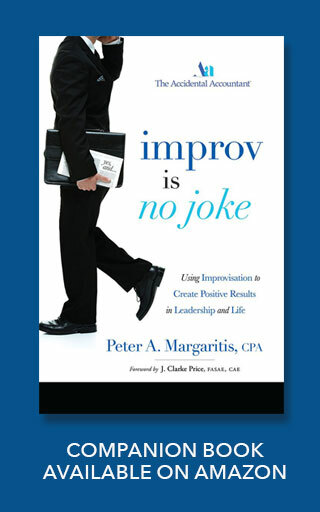 If you’d like to purchase a personalized autographed copy of my book Improv is no Joke: Using Improvisation to Create Positive Results in Leadership and Life, for $14.99 with free shipping, please go to my website, PeterMargaritis.com, and you’ll see the graphic on the homepage to purchase my book. Please allow 14 days for shipping. You can also follow me on social media. You can find me on Facebook, Twitter, LinkedIn or Instagram. Thank you again for listening and remember to use the power of adaptability and Yes, And in dealing with adversity. Ep. 0 – Welcome To Improv Is No Joke! Ep. 9 – John Barlow: Principal Engineer At Honda R&D Americas, Inc.
Ep. 18 – Mark Wyssbrod: CPA, Local Capitalist & President of Small Business CFO, Inc.
Ep. 28 – Jamie Richardson: VP of Government and Shareholder Relations at White Castle Systems, Inc.
Ep. 48 – Build Your Brand with Ria Greiff, Host of NPR’s You Inc.
Ep. 57 – Jason Michaels: You Can Do The Impossible, Too! Ep. 63 – Bob Dean | The New CPE: Collaborative Learning Experiences. Ep. 71 – The Accidental Tour Guide: Peter’s Favorite Places to Eat in the U.S.
Ep. 82 – Tim Sinclair | Business Development: What Makes Your Business Unique & Different?